Firefox / Internet Explorer – the feed should display with links that you can download or stream from. Right click on the links and choose “Save link as” to download them. Chrome – doesn’t display these links which is annoying. You have to add the RSS Extension (https://chrome.google.com/webstore/category/apps). It appears as three orange lines in the top right of your browser. Click on the + sign and paste in the feed URL. It should then display the episodes in a way you can stream or download. Itunes (Windows) – click on the Podcasts tab so that your podcasts display. Click on File at the top left. From the menu select “Subscribe to Podcast” and paste in the URL of the feed. Click ok. If you have trouble seeing all the episodes then switch the view (on the top right) from “Episodes List” to “Podcasts”. Itunes (Mac) – Click on File pulldown menu. From the menu select “Subscribe to Podcast” and paste in the URL of the feed. Click ok. I don’t have a Mac so let me know if this is incorrect. Then paste in the URL of the feed and hit search. Several listeners have added the feed, found that it doesn’t work, deleted it, re-added it and then it works. Very tedious but please give it a try. PodWrangler (iOS) – Listener WW says this plays the sale episodes better than the generic Apple podcasting app. Instacast / Pocket Casts / Overcast (iOS) – Paste the URL of the feed into the search field. I do not use these apps so please correct me if this has changed. Downcast (iOS) – Tap “Add” on the bottom bar, press “Add Podcast Manually” and in the “Feed” field paste the URL of the RSS feed. Then hit “Subscribe” in the top right. Please correct if wrong. Beyond Pod (Android) – Tap the arrow in the top left. Tap “+ Add Feed.” Tap the arrow in a box in top right corner. Tap “Enter Feed Address” and paste in the URL of the RSS feed. Tap “Save”. A wonderfully entertaining series of podcasts. I began with the first 25 or so but now I find I cannot access any but the most recent 20 from the iTunes store. Why doesn’t Apple allow us to see a complete listing of the podcasts available so that we can then download the ones we want? Are you aware of this problem? It’s the same for all podcasts – only the most recent 20 are available! I don’t know why Itunes does that. But if you use the RSS feed (http://thehistoryofbyzantium.libsyn.com/rss) you can see everything. You can manually load this into Itunes and get access to everything. Maybe I’m not doing it right. I purchased the subscription, and got the two RSS feeds listed on the webpage. (“RSS feed of your purchases” and “Full show feed including your purchases”. Now what do I plug into iTunes? I tried right clicking on “RSS feed of your purchases” and copying it, then as you said plugged it into iTunes under “Subscribe to Podcast” but it doesn’t seem to work, it doesn’t list any episodes. Is that the URL I’m supposed to plug in there? Oh, and this is on a Mac. Are transcripts of episodes available for sale? As a teacher, I’d love to have some episodes as a written resource. It ended up being really easy: Thanks Robin! I just purchased the full series for continued playback on my iPhone 6. The paid episodes are behaving (at least the 3 I tried) very strangely. First off, they have no “progress” indicator, the time is listed as going from 0:00 on the left to -0:00 on the right. No slider to move to arbitrary point in the program, a major fault considering what happens next. I pause the podcast and when I resume by hitting play, it starts all over again. I try to use the 15 second advance to get to where I have already listened and then when I get there, it stops and starts the podcast all over again. Twice, I even listened over again to where I left off(no loss there as it remained interesting) but when I got to where I left off, BAM, it stops and starts at the beginning again….. I then hit on the idea of unsubscribing, resubscribing with no change in behavior and then going through the subscription via the safari route listed above to no change in behavior. I then downloaded the program and everything still malfunctions as above, except I can now listen past the previous stopping point. Still have never reached the end of episode 28 due to the many times I need to press pause while listening in the automobile…..Anyone else have this problem with Apple’s podcast software? Are there alternative podcast players for the iDevice universe? Answering my own question. This is definitely a problem with Apple’s podcast app. I just tried Overcast and am now using PodWrangler. PodWrangler is not quite as nice as Overcast but it will do, Overcast want’s yearly in app purchases to continue to use without ads. Hi, I’m so sorry you’ve had problems. And thank you for investigating other options as there’s only so much I can do at this end. Have you been able to listen to them using the new apps? The part that sounded particularly worrying to me was that you downloaded the episodes but still couldn’t play them? That should not be happening. Is that right? They would play in Apple Pod cast but with the unusual behavior of no time markings on them and all the problems of resetting to the beginning if you tried to pause the playback or stopped it in any way. However, in the two app’s from the App Store that I tried, all was well. So, I am using PodWrangler now to listen to the episodes just fine. Thanks for responding. Thank you for all your efforts. The sale episodes are on a separate, much slower (i.e. affordable) server. So the lack of time markings etc is probably a side effect of that. But I hope they could be downloaded to avoid skipping or restarting for anyone else experiencing this problem. Thanks again. How can I purchase the whole series? Thank you. 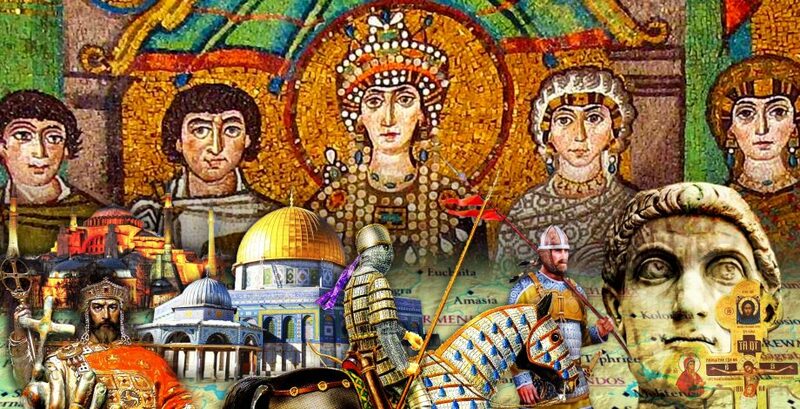 unknown declaration: ‘CDATA[Apodcast telling the story of the Roman (Byzantine) Empire from 476 AD to 1453. http://www.thehistoryofbyzantium.com‘ at line 5, column 22. Is there any way of getting the History of Byzantium on Spotify? Not at the moment because of the ads that run before the show. I know that Acast (the company that runs the ads) is in negotiations with Spotify but I don’t know how close we are to a deal.